He was posthumously awarded the Purple Heart and Combat Infantryman Badge. 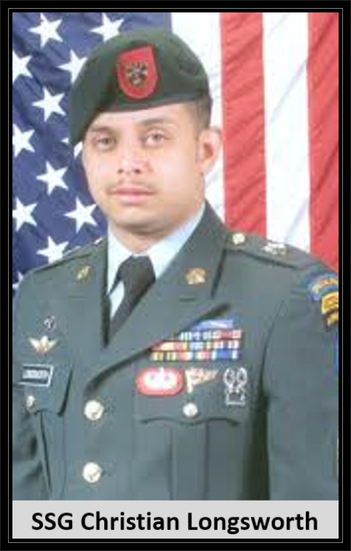 Died: May 19, 2006 in Operation Enduring Freedom. Unit: Army, 3rd Battalion, 7th Special Forces Group, Fort Bragg, NC. Army Staff Sgt. Longsworth was assigned to the 3rd Battalion, 7th Special Forces Group, Fort Bragg, North Carolina. Longsworth died in Oruzgan province, Afghanistan, from wounds sustained when his convoy came under enemy small arms fire during combat operations. Chris graduated from Essex Catholic High School in 1998 and immediate joined the Army. He quickly moved up the ranks from paratrooper to sniper to ranger. Chris was such an inspiration to some of the kids from Newark's gritty streets that they copied his journey into the Army. They changed their lives because they saw how well Chris did with his. He leaves behind a five-year-old daughter. Chris' awards and decorations include the Army Commendation Medal, Army Achievement Medal, Army Good Conduct Medal, National Defense Service Medal, Armed Forces Expeditionary Medal, Afghanistan Campaign Medal, Global War on Terrorism Service Medal, NCO Professional Development Ribbon, Army Service Ribbon, NATO Medal, Expert Infantryman Badge, Pathfinder Badge, Senior Parachutist Badge, Ranger Tab and Special Forces Tab. He was posthumously awarded the Purple Heart and Combat Infantryman Badge. Army Commendation Medal, Army Achievement Medal, Army Good Conduct Medal, National Defense Service Medal, Armed Forces Expeditionary Medal, Afghanistan Campaign Medal, Global War on Terrorism Service Medal, NCO Professional Development Ribbon, Army Service Ribbon, NATO Medal, Expert Infantryman Badge, Pathfinder Badge, Senior Parachutist Badge, Ranger Tab and Special Forces Tab. He was posthumously awarded the Purple Heart and Combat Infantryman Badge. Warrior Leader Course, Basic Noncommissioned Officer Course, Basic Instructor Training Course, Ranger Course, Pathfinder Course, Special Forces Assessment and Selection Course, Special Forces Qualification Course in February 2006, Basic and Advanced Airborne Courses, and Survival, Evasion, Resistance, and Escape Course. Staff Sgt. Christian Longsworth, 26, a Special Forces weapons sergeant assigned to 3rd Battalion, 7th Special Forces Group (Airborne) here, was deployed in support of Operation Enduring Freedom. A native of Newark, N.J., Longsworth enlisted in the Army in 1998 as an infantryman and attended Basic Combat Training and Advanced Individual Training at Fort Benning, Ga.
His first assignment was with the 4th Battalion, 31st Infantry Regiment at Fort Drum, N.Y., where he served for more than two years. In 2001, he transferred to Eglin Air Force Base, Fla., where he served for almost three years as a member of the cadre team for 6th Ranger Training Battalion before volunteering to become a Special Forces Soldier.